Bridgestone is the world’s largest tyres manufacturer. They also produce other rubber products and have nine tyre manufacturing plants in Europe alone. 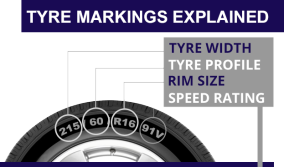 Bridgestone has a range of tyres covering sport, touring, winter and 4×4 driving. Their tyres provide enhanced performance without sacrificing ride comfort. Bridgestone has a long history of tyre innovation. In 1951, they were the first company in Japan to sell rayon cord tires. That year also saw a mew Bridgestone building opened in Kyōbashi, Tokyo, which contained a Bridgestone Museum. Their sales surpassed the ten billion yen mark in 1953, placing Bridgestone at the very top of the Japanese tyre industry. Bridgestone began selling nylon tires in 1959, at which point work went ahead on the construction of its new Tokyo plant, which was eventually opened in 1960 to cope with the fast-expanding market for motor vehicles. Today, an amazing 1 in 5 vehicles in the world is fitted with a set of Bridgestone tyres. Bridgestone is committed to its mission, which is ‘serving society with superior quality’ tyre products. Bridgestone is a major supplier of original equipment to all of the major car manufacturers including Volkswagen, BMW, Mercedes, Ford Toyota and many, many more.